The primary goal of Podemos is to marshal an ample majority, which means in practice to build a middle-class party, and to give up the traditional Left/Right axis for a position of centrality. Español. Podemos rallies on January 31, 2015, for political change in Spain. Vicente Vallejo/Demotix, All rights reserved.After Syriza’s leader Alexis Tsipras was sworn-in as Greek prime minister, the attention of many in Europe and beyond is now turning to Podemos’ leader in Spain. Pablo Iglesias. Tellingly enough, the first tweet from Mr. Tsipras, as soon as he got home on election night after being acclaimed in the squares of Athens was: “First we take Athens, then we take Madrid @PabloIglesias_#syriza #ekloges2015 #ChangeEurope #Podemos @europeanleft”. It is hard to tell how many people recognized in that tweet the reference to Leonard Cohen’s 1987 song, “First we take Manhattan”. During his election campaign, Mr. Tsipras used the reference and launched the slogan “First we take Athens, and then we take Berlin” aimed to convey the need to change austerity policies not only in Greece but primarily in Germany, for obvious reasons. Besides, for a generation now in their forties and fifties, the lyrics of Mr. Cohen’s 1980’s songs embody a somehow romantic spirit of rebellion and a determination to stand up to a system that was crushing them under the weight of a Reagan-Thatcher triumphant neocon revolution, installing a global ‘casino capitalism’ and triggering the dismantling of the Keynesian welfare state - the same sense of rebellion we are now witnessing in Greece and Spain. First we take Manhattan, then we take Berlin”. 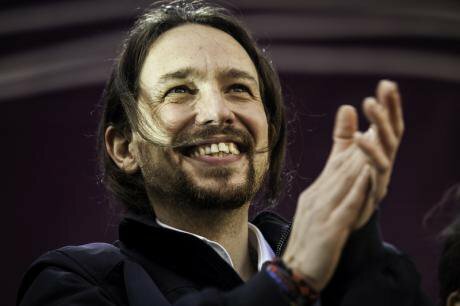 Mr. Iglesias is very keen on using popular culture icons and usually ends the meetings of his newly-formed party Podemos chanting Spanish protest songs from the 70’s, emblematic for a generation that fought Francoist Spain from the Left – his parents’ generation. But Pablo Iglesias (born in 1978), like Alexis Tsipras (born in 1974) - or even Matteo Renzi (born in 1975)- were only teenagers when the neocon revolution of the 80’s started to show its vicious effects, and the Great Recession headwinds that started to blow in 2008 caught them in their early thirties. They have all lived the bulk of their political career through a dark age of debt, unemployment, structural reforms (meaning basically social rights and budget cuts) and fiscal austerity. Leaving aside the Italian experience (for Beppe Grillo’s 5 Stars protest movement is a very particular case, impossible to dissociate from Berlusconi’s noxious age, while Mr. Renzi is more of a pragmatic social-democrat than a radical leftist), observers and commentators are keen to compare Syriza and Podemos as two sides of the same coin. Obviously, that is not contested but cheered on by their leaders, as Mr. Tsipras’ tweet shows. But the differences are palpable, and it is adventurous to predict a landslide Syriza-like victory for Mr. Iglesias in the upcoming cycle of Spanish elections: early regional elections in Andalucía in March, followed by local and regional elections in May, Catalan early regional elections in September, and finally general elections, probably by end of the year. This hectic electoral cycle that includes high volatility in voters’ intentions may prove very demanding for a political formation still in its infancy, whose main declared objective is ousting the long-established, well-organized and powerful traditional conservative and socialist national parties, PP and PSOE. Podemos is currently under very close scrutiny from mainstream media and all the enthusiasm and expectations built up by its leaders is meeting the head-on resistance of what Mr. Iglesias calls “la casta” (the caste), by which he means the politicians and other powerful actors who currently call the shots. Since their first unexpectedly excellent performance in the May 2014 European elections (where they came fourth, reaped 8 % of the vote, that is 1,250.000, and won 5 seats), they have been showing impressive scores in the polls, some of which are even giving them a lead in the upcoming general elections. So, the question everybody is asking in Spain now is: will Podemos match these expectations and win the battle? Podemos has grown in the fertile soil of a country devastated by the Great Recession where people feel the time is ripe for radical change. For the first time since the Civil War, the Spanish middle classes, both upper and lower, have moved backwards. They have experienced the breakdown of the social elevator, they have suffered from heavy indebtedness and extensive unemployment, and they have seen their social rights threatened by austerity policies imposed not by their elected government in Madrid, but by unelected technocratic bodies in Frankfurt and Brussels. Furthermore, as the years of fast growth, easy money and straightforward credit are long since gone, Spain’s structural deficits have become all the more apparent. The Spanish post-Transition settlement was hailed as a success story of the 90’s and 2000’s, and this claim had some objective truth in it. One tends to forget that only ten years ago Spain was the country in fashion in the European Union and was presented as an example of democratization praised by the media, politicians and academia alike. Even the usually sober The Economist (June 26, 2004) was enthusiastic about the country’s achievements: “In under 30 years Spain has emerged from dictatorship and international isolation, built a successful economy and established an effective democracy. Perhaps no other European country has achieved so much, on so many fronts, so quickly”. Obviously, Spain had some objective merits: the generous money flowing in from the EU’s structural funds, with some exceptions, was cleverly used in building high quality infrastructures; a 16 year-long period of progressive governments managed to establish a first class public health system, a modern army and a functioning administration; an increasing number of SMEs became net exporters and Spanish multinational corporations in strategic sectors like banking, energy, communications, building or clothing expanded internationally and conquered markets in Europe, Latin America and beyond. But structural deficits in the labour market and in the education system, along with evident shortcuts in key sectors like the local financial system (specifically, a maverick saving-banks scheme) were not tackled during the happy years and were only aggravated when the crisis hit the country with particular cruelty. Both well-established and emerging middle classes preferred to borrow money to buy nice cars or second flats rather than spend their money in educating their children to cope with the hard times that may lie ahead, and were caught heavily indebted when the Great Recession wiped out their jobs and their rents. Suddenly impoverished, they witnessed how a stubborn and unmerciful austerity policy, hardened by the Eurozone debt crisis that started in late 2009, aggressively cut back salaries and social services. Structural reforms imposed by Brussels technocrats, as translated by the government of the Popular Party into its core neoliberal beliefs, further liberalized a labour market already hit by heavy unemployment. For the sake of competitiveness, Rajoy carried out an internal devaluation as the one and only remedy to bring Spain back on its feet. The social costs of the formula often referred to locally as the “austericide” which brought about a pervasive “precariat”, were dismissed by the mainstream parties (and, significantly, the established trade unions) as sacrifices unavoidable if economic growth was to be recovered. The backlash to these stern measures took the form of a widespread mobilization throughout Spanish society that surfaced with all its strength during the Indignados movement in May 2011. The movement’s appeal went well beyond grassroots activists and reached out to embrace a fair portion of the impoverished middle classes. Slogans such as “They do not represent us” or “They bailed out the banks, not the people” eloquently framed the problem and identified the culprits: the banking system, the corrupt mainstream politicians in power, and a more abstract “Merkelian” Europe. Suffering is never for free. The poor can endure suffering (and a good part of the Spanish people’s resilience has to do with the fact that Spain was, until recently, a poor country), but when the poor have managed, through hard work, savings and sacrifice, to claw their way into the middle classes, they are less likely to accept impoverishment without a fight. And that is essentially what Podemos is about. Even if the painful scars of an austerity policy were to begin to heal with a teetering, incipient economic recovery, Spanish citizens are indignant at the way in which things have been managed, and seem ready to give young Podemos a chance. Its smart leaders, most of them professors of political science at university departments, have drawn an accurate diagnosis and set up a well-designed political operation aimed at “assaulting” power, while leading a preexisting though fragmented protest popular movement. One of Pablo Iglesias’s famous and controversial statements is “You only conquer heaven by assault”. A carefully-chosen progressive look - including blue-jeans, unbuttoned collar white shirts, a budding Jesus-Christ-like beard and a pony tail - along with carefully-written speeches that use fighting metaphors and patriotic historical references are giving him the necessary emotional ballast to win the rhetorical battle over his flat-tone, boring, old conservative adversaries, both right and left. Podemos’s leaders know that, if they are to have any chance of achieving power, even if they are perceived as a left-wing party. they need to become a “catch-all party”, one that brings together people from all walks of life. Podemos is, in this respect, unlike Siryza, which is clearly and admittedly a radical left-wing party. Podemos seeks the vote of those who are disenchanted with politics, but also those who are infuriated by the policies of both Left and Right, those who have a job and those who are unemployed, grassroots activists and engaged twitterers, young and old, rich and poor. Their primary goal is to marshal an ample majority, which means in practice to build a middle-class party, to give up the traditional Left/Right axis for a position of centrality, and to base their discourse on the rejection of the ruling political class. They seek to polarise the political arena, and present the contest as a combat between Podemos and the PP, leaving out the PSOE, in alignment with a strategy that wishes to conquer the whole spectrum from the Left. All of this, they do for the benefit of “the people”, a concept that includes everybody. Even though they claim they are simply the expression of a popular movement, as a laboratory-designed political product, they have reproduced the matrix of classical political parties, including a hierarchical and centralized structure headed by a strong, charismatic leader, and a ring of secretary-generals in the regions. Their intensive use of social media and media platforms – including tailor-made talk TV programmes–precisely demonstrates their will to impact a very wide audience. But once the political party is up and running, its leader is universally known and appears constantly in the mainstream media, the challenge will be to keep building momentum while at the same time to avoid the dangers of overexposure and burn-out. The besieged middle classes, exhausted from a seven-year unprecedented economic crisis and embattled in a number of conflicts arising from a dismantled welfare state and the greed of the banking, energy and telecom companies, are ready to give Podemos a chance. The overwhelming corruption cases affecting the two main political parties, and their eloquent incapacity in giving adequate answers to the citizens’ growing anxieties, is doing the rest. “Now is the moment”, said Pablo Iglesias in front of an enthusiastic gathering in Plaza del Sol at the end of a successful and massive “March for change” on January 31 in Madrid. Podemos’s leaders are conscious that the social and political conditions today are ripe for building a momentum for change, but will not last forever. It is true that mainstream conservative and social-democrat parties seem paralyzed at the thought of losing power and tend to stick to old mechanisms instead of experimenting, but their powerful machineries will undoubtedly roll into action for the electoral battle which, this time, will depend on whether they manage to hold onto the hegemony they have enjoyed during the last 40 years. If Podemos brings the Spanish two-party system to an end and shakes the obsolete mental schemas of the established parties so as to force them to react, its contribution to Spanish democracy will definitely be an invaluable one. In turn, if and when they achieve power, whether at local, regional or national level, they will be forced to compromise and to make less than optimal decisions, thereby paying the price for exercising democratic power and possibly witnessing the beginnings of their own decline. The case of Syriza in Greece, albeit very different in many ways, including the lucky fact that Spain avoided a toxic full bailout from the Troika, has some fundamental similarities, not least the claim, heard all over Europe, of the current necessity to “recover sovereignty”, the patriotic need to “recover our country” for “the people”. Today it seems that many are willing to grant them one go at improving a sclerotic European democracy, but only on condition that this does not mean a return to the lethal populism and troublesome nationalism that has already destroyed Europe twice in the twentieth century. The fate of Alexis Tsipras’ government and the way he manages the systemic contradictions he will have to face in power will be an inevitable reference point for many potential Podemos voters in the Spanish elections. Some of those contradictions have begun to emerge, from an all-male cabinet to an unpalatable coalition with a right-wing nationalist/populist party. It will certainly take a lot of enthusiasm and goodwill from many people to make Mr. Tsipras’ tweet become a reality. That night, to many in southern Europe, euphoria (from Greek euphores: well being) was the name of the game. His “First we take Athens” is already a fact but, realistically, “Then we take Madrid” is much more uncertain. Maybe this time, against Mr. Cohen’s proverbial pessimism, it will be worth it for many southern Europeans to risk the boredom of trying “to change the system from within”, which is precisely what “radical Left” Syriza wants to try now. Neither Syriza nor Podemos have any revolutionary intention, in spite of what some right-wing fear-mongering media want us to believe. Back in July 2013, Mr. Yanis Varoufakis, today’s new Greek Finance Minister, co-authored a refurbished 4.0 version of some policy recommendations for a rational resolution to the Euro Crisis, under the general title of a “Modest Proposal”: “We propose that four areas of economic activity be europeanised: banks in need of ESM capital injections, sovereign debt management, the recycling of European and global savings into socially productive investment and prompt financing of a basic social emergency programme”. This is what Greece may need right now: a European Emergency Plan to deal with an unreasonable financial, social and humanitarian crisis. Have we come all this way to find out that the solution is a more humane Europe? Call it radical, if you wish, a challenge to the establishment, but to me it is only reasonable, and feasible, if young leaders in Athens, Rome and Madrid manage to convince policy-makers in Frankfurt, Brussels and Berlin to get together on this.